The Bhutanese have always lived in harmony with and full respect for nature. The kingdom is one of the world’s ten biodiversity hot spots, very unique, pristine and intact. The country's government wants to maintain a balanced natural ecosystem, with environmental conservation and sustainable development as her pillars. With her splendid scenic beauty surrounded by impressive mountains and many rare and endangered species of flora and fauna, Bhutan is a nature lover’s dream. Because of her geographical situation, the land of Druk Yul knows different climats. As an effect, you’ll find a wide variety of plants, flowers and trees here. Besides dense forestation, grazing lands, luscious green valleys, wild flowing rivers and crystal blue lakes, you also find alpine mountains with snowcapped peaks and impressive glaciers. Bhutan’s rich flora also contains over 5.500 species of vascular plants like beautiful rhododendron species, magnolias, over 600 orchid species, many medical plants, beard moss and the delightful blue poppy, Bhutan’s national flower. National parks & wildlife sanctuaries In order to protect the ecosystems, about 26% of Bhutan consists of national parks, nature reserves, wildlife sanctuaries and conservation areas. The main ones are the Royal Manas National Park, Jigme Singye Wangchuk National Park (also known as the Black Mountains), Thrumshing La National Park, Jigme Dorji National Park, Bumdeling Wildlife Sanctuary, Kulong Chhu Wildlife Sanctuary, Khaling Wildlife Sanctuary, Toorsa Nature Reserve, Phipsoo Wildlife Sanctuary and Sakteng Wildlife Sanctuary. In additon a further 9% of the country functions as a biological corridor, connecting protected areas. With 35% of the country being protected by some form of conservation management, the Bhutanese system for the conservation of biodiversity is globally unique. It's not only Bhutan's flora that will capture your heart. It's also the kingdom's wildlife that's impressive and wildy varied with over 165 species of mammals, many of them endemic to Bhutan. 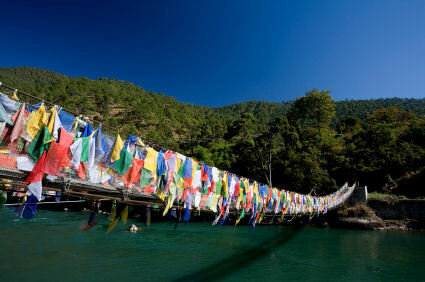 It is the land of tigers, elephants, golden langurs, butterflies, water buffalos, bluey sheep, rhesus monkeys and yaks which are the pets of many Bhutanese people. The high Himalayas are the domain of the snowleopard. The royal kingdom is also a bridwatcher’s paradise with over 620 birdspecies. Many of them are endemic to Bhutan, like the palas osprey, the black necked crane and the hornbill. 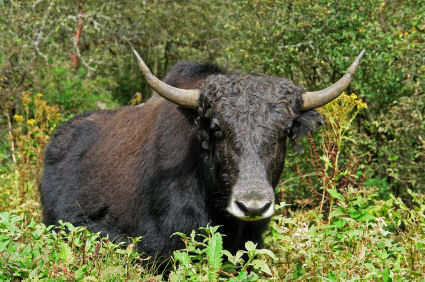 The Takin is Bhutan’s national animal, being very unique and holding strong associations with myths and religious history.